Details on these positions and how to apply for them are listed below. Planned Parenthood Generation Action is pleased to announce a call for application for the 2015 Young Leaders Advisory Council (YLAC). The YLAC provides the opportunity for exceptional student advocates to be more deeply engaged with the work young people are doing across the county, from a National perspective. It will offer them the chance to lead national leadership, advocacy, and movement building efforts that enable and advance the work young people are doing on the ground. The Young Leaders Advisory Council will represent the youth voice at National Convening’s and launch National campaigns to support young activists to emerge asleaders in the movement for sexual and reproductive freedom. Provides advice and input on youth oriented materials, national conferences, and campaigns. Advises the PPGA leadership and affiliates on matters pertaining to young people. Assists young people in becoming spokespeople for affiliates and PPGA. Terms: Each accepted YLAC member is agreeing to serve a one-year term, which expires in December 31st, 2015. All completed applications are due on December 15th, 2014 to Erin Carhart, National Campus Organizer, erin.carhart@ppfa.org. A completed Young Leaders Advisory Council application, including cover letter, resume, application, and letter of recommendation, is required. Connect & Breathe is a non-judgmental after-abortion talkline. Connect & Breathe creates safe space to talk about abortion experiences by offering a talkline providing unbiased support and encouragement of self-care. The talkline is staffed by adult women and men volunteers with diverse educational and professional backgrounds. Most are not professional counselors, although all volunteers successfully completed our training program. Connect & Breathe is an equal opportunity employer and supports workforce diversity. They do not discriminate on the basis of race, creed, color, national origin, religion, sexual orientation, age, marital status, handicap, disability or status as a disabled veteran or veteran of the Vietnam Era. How much time do volunteers commit to Connect and Breathe? Volunteers cover at least two shifts per month. If you’re interested in being a part of Connect & Breathe’s talkline staff, or if you’d like to learn more, please contact the Volunteer Team at volunteer@connectandbreathe.org. Sisterhood and Feminism is offered through SBAI, and you can find key points about this course below. 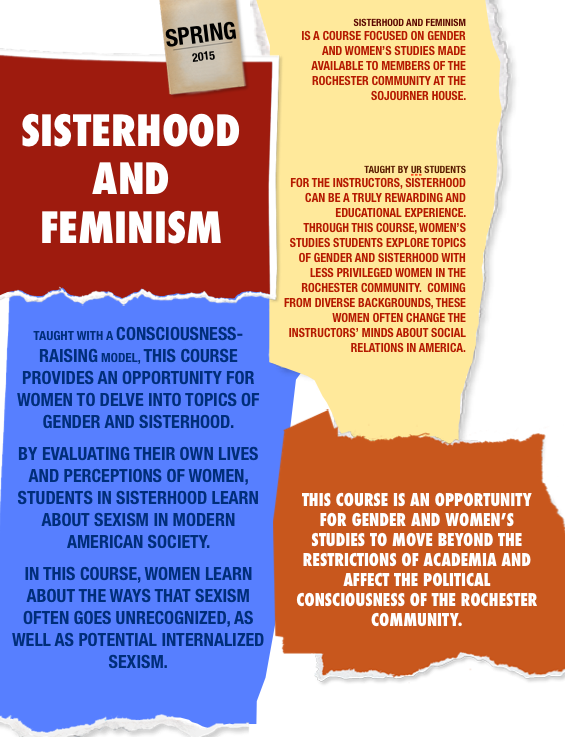 Read more at our Sisterhood and Feminism page, and be in touch with sbai@rochester.edu if you’d like to apply to participate in the 2015 program of Sisterhood and Feminism!